I was recently asked to name a culinary icon, and the first person to come to mind was Maida Heatter. I’ve been following her career for years and own all her books, my favorite being “Maida Heatter’s Cookies” which is where you’ll find Chocolate Whoppers. In the book, Maida tells a story about being served the cookies while dining at one of her favorite restaurants, The Soho Charcuterie. The chocolate cookies, which she hadn’t ordered, were big, fat, beautiful and delicious, so of course she asked for the recipe. Surprise! They told her the recipe was actually hers. They’d taken it from her first book, increased the size of the cookies, and named the Chocolate Gobs. 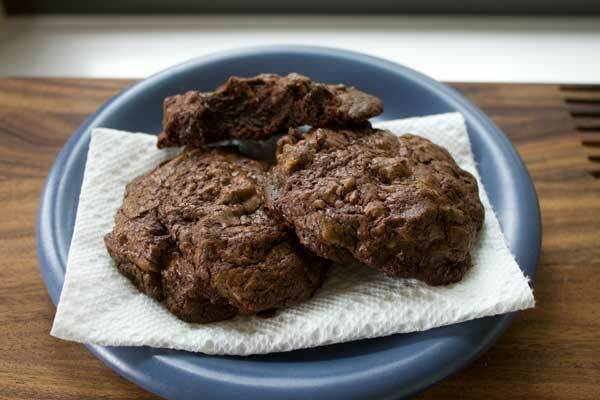 Maida’s original version was called Charlie’s Cookies, named after a friend of hers who was a World War II Pilot. I’ve made these over and over throughout the years and they are one of my top favorites. Mine never turn out quite as pretty as some others, but the inside tastes better and is less sweet than some. Chocolate Whoppers or Chocolate Gobs aka Charlie's Cookies -- a favorite! Preheat the oven to 350°F. Line two cookie sheets with regular foil (as opposed to nonstick or parchment). Place the unsweetened chocolate, semisweet chocolate, and butter in the top of a small double boiler or in a bowl set over simmering water. Stir until melted and smooth. Remove the top of the double boiler and set aside. You can also do this step in the microwave. I like to melt the butter first, add the chopped chocolate, stir so that the chocolate melts as much as it can from the heat of the butter, then microwave at 50% power stirring ever 30 seconds until melted and smooth. With an electric mixer, beat the eggs, sugar, coffee or espresso, and vanilla at high speed for two minutes. Beat in the melted chocolate mixture on low speed just to mix. Add the dry ingredients and mix, scraping the sides of the bowl as necessary with a rubber spatula to incorporate the ingredients. Remove from the mixer and transfer to a larger bowl. At this point, make sure the batter has cooled to room temperature. If you add chocolate to warm batter/dough, it will melt into it. Stir in the chocolate morsels and the nuts and if necessary, chill the dough for about 20 minutes or until it is thick enough to scoop. Use a 1/3-cup metal measuring cup to measure the amount of batter for each cookie, put five cookies on each cookie sheet, one in the middle and one toward each corner. Use a rubber spatula to push the mixture into the measuring cup and then to scoop it out onto the lined sheet (the dough is gooey). Do not flatten. Bake one sheet at a time or two sheets at a time, reversing the sheets top to bottom and front to back once during baking to ensure even baking. Bake for 16 to 17 minutes-no longer. The surface of the cookies will be dry but the insides will still be soft. There is really no way to test these; just use a portable oven thermometer before baking to be sure your oven is right, and then watch the clock. When the cookies have cooled, use a wide metal spatula to release them and turn them over to air the bottoms a bit. Maida uses 2 cups of nuts, but I only use about 1. This changes the yield of the cookies from 15 to about 12. Thank you so much for posting this recipe. I use to get these at a bakery near where I worked. I wanted to drive over to order a couple of dozen and the owner told me they no longer made the cookies (whoppers). I decided to Google it on an off chance that I would find the recipe and there it was, pic and all. Bless you all!!!!! These look wonderful and I’m off to make them right now. I love the story! I have been making these cookies for years,like Marie I also got the recipe out of one of the women’s magazines. Everyone that eats one or a half of one love them. High in calories but I’m in heaven when I eat them. Whoppers are the best! The picture I posted doesn’t do the cookie justice. In fact, they look a lot more like the cookie I called “Shiny Happy Cookies” which are similar to Whoppers and also very good. I have been searching for this recipe for years. I saw it in a Family Circle issue and loved it. I wrote down the recipe and tossed the mag only to later find out that I omitted SUGAR! I tried the recipe 3 different times with different amounts of sugar and none came out right. I have searched the web several times including Family Circle archives and found nothing. Thank you so much for posting this recipe! I’m 8 months pregnant and am running out of time to splurge on a 375 calorie cookie! I’ve been making these cookies for 14 years with a recipe I found in a womans magazine without the coffee. I call them my Christmas cookies because I make them at that time of year. I’ve been making these repeatedly this week, and it just makes me remember how much I love them…I’ll be posting something about it soon.